About the World Cup in football - 2018 does not speak now only lazy, especially in St. Petersburg, where this event is being prepared for several years. And although most of us will follow the football battles near the TVs, very soon on the streets you can meet lucky ones who will personally go to the stadiums. While you doubt whether to buy the coveted ticket, we will tell you about what opportunities will be available to fans. This is not even a privilege, but an obligatory attribute of the fan. Without this document, it will be impossible even to get to the stadium, not to mention taking advantage of other bonuses and benefits. So FAN ID, he's a "fan's passport", you'll need to get it, and then save as an apple of the eye. You can get a FAN ID only after purchasing a ticket for the World Cup match. Having received the coveted ticket, you must apply, by contacting one of the issuing centers, or online. But to receive a ready-made document is necessary personally. The pleasure from the upcoming championship can be pretty spoiled by bureaucratic delays. This is especially true for foreigners, because they have to deal with issues related to traveling to another country. Helps them in this all the same FAN ID. A foreign holder of a fan's passport gets the opportunity to repeatedly come to Russia without issuing a visa, which is why the process of issuing a FAN ID is so rigidly regulated. Matches of the championship will be held in 11 cities-organizers, which means that many fans will inevitably face the problem of moving. Moving around our country sometimes is not only long, but also expensive, and in summer, railway tickets snap like hot cakes. The organizers tried to solve this problem by introducing special free routes for fans. For this purpose, several hundred additional trains have been allocated, which will run between the cities-organizers. All spectators of the championship will have the right to free travel, but to take advantage of it, it will be necessary to observe a number of formalities: register on the site, fill in all the necessary data and choose a route. It is important to remember that the principle of First Come First Served applies to the distribution of free tickets, so do not delay, otherwise you just might not have enough space. Of course, to get to the stadiums to see live matches of your favorite teams will not work for everyone, but almost everyone will feel at the center of events and among like-minded people. You can gather in front of screens at home or in sports bars, or you can go to the Festival of FIFA fans. It will be a real football festival for everyone. In addition to live broadcasts, fans will organize concerts, exhibitions and meetings. Entrance to these fan zones will remain free. In Moscow, the venue for the Festival of FIFA fans will be Vorobyovy Gory, according to an approximate calculation, up to 25 thousand people can stay here. In St. Petersburg, fans will be given the Koniushennaya Square, where you can collect about 15 thousand spectators. The FIFA World Cup is an event whose memory you want to keep for a long time. A great way to do this is to buy something symbolic. In all city-organizers official shops with souvenir products of the Championship will work. On the shelves will appear all sorts of football attributes with the logo of the upcoming match: T-shirts, caps, balls, key rings, magnets, toys and dozens of goods for every taste. The favorite of the buyers is already the restless official mascot of the championship - the wolf Zabivak. In St. Petersburg, a store with souvenir products for the championship has been working since December last year, you can find it in the SEC "Gostiny Dvor". Actively prepare for the World Cup in football should not only players, but also fans. And if the issues with the purchase of tickets and the registration of the necessary documents are resolved, you can take a little time. To do this, a tour around the cities-organizers went mobile park. Since the end of March every weekend he stops in one of the cities and accepts everyone. For the guests organize competitions, competitions, football rides and interesting meetings. Admission is free, so there are enough people. 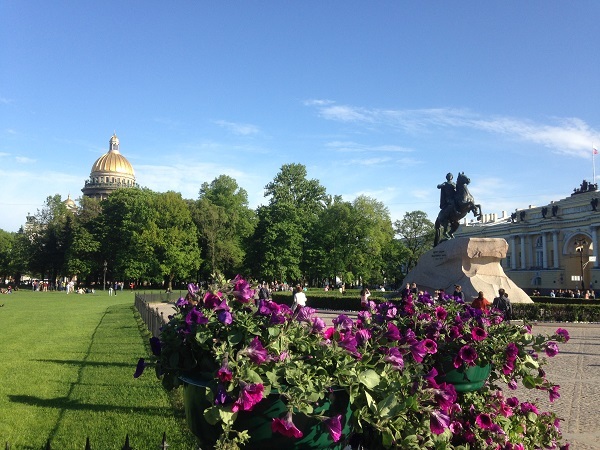 In St. Petersburg, the park will operate on the weekend of May 19 and 20. It is expected that thousands of foreigners will come to the World Championship in Russia, and our compatriots, who have first entered the city-organizers, will be no less. In honor of this event, it was decided to take care of the cultural leisure of fans, setting for them preferential prices for visiting museums and theaters. Not all city cultural institutions will take part in the action, but it is always pleasant to receive a discount. Fans can use it with a decorated FAN ID. On the eve of the World Cup every person can become a part of a big sports family, and for this it is not necessary to be able to play football. The team of champions unites those who want to be in shape for the upcoming football holiday. 11 star ambassadors in terms of the number of participating cities launched their own Challenges and offer all comers to compete for memorable prizes. You can run with Alexey Smertin, cook together with Sergei Svetlakov, sit on the splits with Alexei Nemov, dance with Nyusha. Join now!